Just How Big is Horus? Yes right up there along a ridge line in Marin County, California there is a stature of the ancient Egyptian hawk headed god Horus. The finely delineated sculpture has a commanding view of the mountain as well as the surrounding landscape. Who placed the sculpture there, why and when is anybody’s guess. It was recently discovered by a group of firefighters who were clearing brush on a fire break project along the ridge. I was contacted by a local police agency to see if I could shed any light on the sculpture and who may have made it. After three days of exploring the general area along the ridge line I was able to find the well hidden site. What a wonderful surprise discovering this lonely sentinel, a copy of the sculpture from the famous temple at Edfu without the crown. I cannot disclose the location of the site as I have been sworn to secrecy so as to prevent vandalism. It makes one wonder what other mysteries are on the mountain let to be discovered! 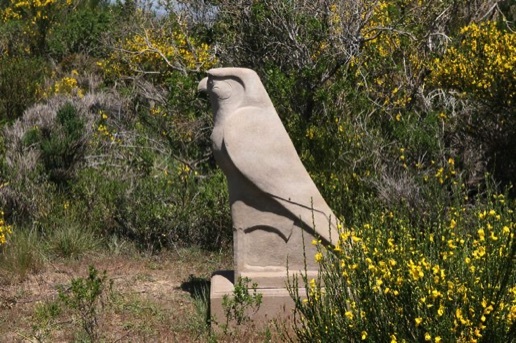 Horus is located in a clearing at the top of a ridge commanding a spectacular view of Mt. Tamalpais. 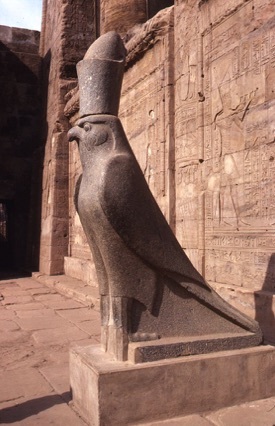 Side view of Horus. The sculpture is 46 inches tall including the base. The cast concrete sculpture is estimated to weigh around 1,200 lbs. The question is how did anyone get it to its present very remote location? Close up of Horus showing some damage to his beak. Right side of statue of Horus with surrounding landscape. 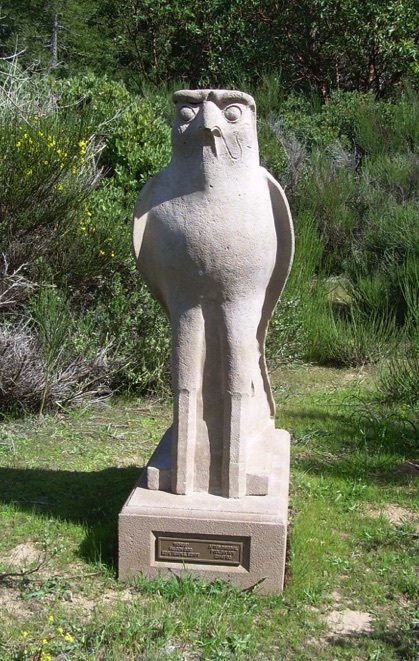 Full front view of Horus showing a bronze plaque embedded in its base. Embedded bronze plaque at base of sculpture.